In ESRD, arterial function is abnormal, characterized by decreased capacitive function (arterial stiffening) and reduced conduit function, shown by diminished flow-mediated dilation (FMD). The pathophysiology of these abnormalities is not clear, and this cross-sectional study analyzed possible relationships among arterial alterations and cardiovascular risk factors, including mineral metabolism parameters, such as serum parathormone, and vitamin D “nutritional” and “hormonal” status by measuring serum 25-hydroxyvitamin D [25(OH)D3] and 1,25-dihydroxyvitamin D3 [1,25(OH)2D3] levels. Aortic stiffness (pulse wave velocity), brachial artery (BA) distensibility (echotracking; n = 42), BA FMD (hand-warming; n = 37), and arterial calcification scores (echography and plain x-rays) were measured in 52 stable and uncomplicated patients who were on hemodialysis. 25(OH)D3 and 1,25(OH)2D3 serum levels were low and weakly correlated (r = 0.365, P < 0.05). After adjustment for BP and age, multivariate analyses indicated that 25(OH)D3 and 1,25(OH)2D3 were negatively correlated with aortic pulse wave velocity (P < 0.001) and positively correlated with BA distensibility (P < 0.01) and FMD (P < 0.001). Arterial calcification scores were not independently associated with 25(OH)D3 and 1,25(OH)2D3 serum concentrations. These results suggest that nutritional vitamin D deficiency and low 1,25(OH)2D3 could be associated with arteriosclerosis and endothelial dysfunction in patients who have ESRD and are on hemodialysis. Cardiovascular complications are the leading cause of death of patients with ESRD (1), and the results of epidemiologic and clinical studies showed that large artery damage is a major factor that contributes to the mortality of these patients (2,3). The arterial system has two distinct, interrelated functions: To deliver an adequate blood supply from the heart to peripheral tissues (i.e., the conduit function) and to dampen blood flow and pressure oscillations that are caused by intermittent ventricular ejection (i.e., the cushioning function). Conduit function depends primarily on the diameter of the arterial lumen. It is highly efficient, and its physiologic adaptability is mediated through acute arterial diameter changes, which depend in large part on the endothelium response to alterations of shear stress, a phenomenon called flow-mediated dilation (FMD) (4). Conduit function disorders result from the narrowing of the arterial lumen or the diminished ability of the artery to dilate in response to shear stress changes. The cushioning function is altered by diminished distensibility that is caused by stiffening of arterial walls. Arterial stiffening results from fibroelastic intima thickening, increased collagen accumulation, and fragmentation of elastic lamellae with secondary fibrosis and calcification of the media (5). In patients with ESRD, both aspects of arterial functions are abnormal, characterized by arterial outward remodeling (6,7), increased arterial stiffening (6,7), and decreased FMD (8,9). These anomalies are enhanced further with aging, but these age-related effects are accelerated in uremic patients, in whom they are predictive of all-cause and cardiovascular mortality (3,10). The pathogenesis of these dysfunctions is not entirely clear. Conventional risk factors, such as aging and hypertension, only partly explain arterial abnormalities in patients with ESRD. Intimal and medial arterial calcifications (AC) are frequent in patients with ESRD (11); they result in arterial stiffening and abnormal conduit function and are associated with poor outcome (12). Several mineral metabolism disorders have been associated with increased AC and cardiovascular risk, including hyperphosphatemia, hyperparathyroidism, and increased calcium-phosphate product (13). Patients with chronic kidney disease and ESRD have vitamin D deficiency that is characterized by low serum 25-hydroxyvitamin D [25(OH)D3] levels (14). With the decreased capacity of 1-α-hydroxylase to synthesize calcitriol (1,25-dihydroxyvitamin D3 [1,25(OH)2D3]), the serum levels of the “hormonal” form of vitamin D also are low. Results of studies on the general population indicate that poor vitamin D status, characterized by low serum 25(OH)D3 levels, is associated with higher prevalences of chronic heart failure, hypertension, and hyperparathyroidism (15–18), all frequent complications of ESRD. The purpose of this study was to analyze potential relationships among arterial and mineral metabolism disorders, including the vitamin D system, in stable patients who had ESRD and were on hemodialysis. Fifty-two stable and uncomplicated patients who had ESRD and were on hemodialysis for at least 3 mo (median 46; range 3 to 364 mo) were included. ESRD resulted from chronic glomerulonephritis (n = 23), interstitial nephritis (n = 10), polycystic kidney disease (n = 6), hypertensive nephroangiosclerosis (n = 7), and other (n = 6). Patients were eligible for inclusion when they had no clinical cardiovascular complication, including coronary or peripheral artery disease, chronic heart failure, or atrial fibrillation, and they agreed to participate in the study, which was approved by our institutional review board. Patients underwent dialysis 4 to 6 h three times weekly to control body fluids and blood chemistries. Twenty-four patients with ESRD received antihypertensive therapy (angiotensin-converting enzyme inhibitor and/or calcium channel blocker), which was stopped 10 d before the determinations were made. Three patients were current smokers. Patients were naive to vitamin D supplementation (oral or active vitamin D) or calcimimetics. Sevelamer was used as the phosphate binder. Erythropoietin was administered to 43 patients to maintain hemoglobin at ≥110 g/L. Measurements were obtained in a temperature-controlled (23 ± 1°C) room before the first hemodialysis of the week. BP was measured with a mercury sphygmomanometer after 15 min of recumbency using phases I and V of the Korotkoff sounds, respectively, as the systolic BP (SBP) and diastolic BP. The arterial system is heterogeneous in its structure and function. The cushioning function is ensured principally by the functional and geometric properties of the aorta, whereas peripheral arteries, such as the brachial artery (BA), fulfill more conduit function. For these reasons, we analyzed separately the cushioning properties of the aorta and the BA. Aortic Stiffness Assessed as Aortic Pulse Wave Velocity. Aortic pulse wave velocity (PWV) was determined automatically with a dedicated device (CompliorSP; Artech Medical, Pantin, France), as described previously and validated (19). Simultaneously recorded pulse waveforms were obtained transcutaneously over the common carotid artery and femoral artery in the groin. PWV was calculated as the distance between recording sites measured over the surface of the body, length from the suprasternal notch to the groin (L), divided by the time interval (t) between the feet of the flow waves (PWV = L/t), which was averaged over 15 cardiac cycles. BA distensibility was measured in 42 patients. BA wall motions were measured independently with a high-resolution B-mode (7.5-MHz transducer) echotracking system (Wall-Track System, Maastricht, The Netherlands), which was described previously in detail (6,7). Briefly, vessel walls are identified automatically and their displacement is tracked throughout the cardiac cycle. According to phase and amplitude, the radiofrequency signal over six cardiac cycles is digitized and stored until analysis. The accuracy of the system is ±30 μm for diastolic diameter (Dd) and less than ±1 μm for stroke-diameter change. Radiofrequency matrixes were acquired during 2 to 4 s, and acquisitions were repeated every 10 s. One patient period corresponded to 450 radiofrequency acquisitions (500 to 700 megabytes). The entire procedure was videotaped on S-VHS tapes for image analysis. BA distensibility was calculated from systolic diameter (Sd) minus Dd BA changes (Sd − Dd; i.e., stroke-diameter changes) and BA pulse pressure (ΔP) according to the formula distensibility = 2[(Sd − Dd)/Dd]/ΔP(kPa−1× 10−3) (6). BA FMD was evaluated in 37 patients. FMD was analyzed by BA inner diameter changes that were induced by hand-warming–induced changes in blood flow (20,21). The glove-protected hand of the arm opposite the arteriovenous shunt was introduced into a water-filled thermocontrolled device (Polystat 1; Fisher Bioblock Scientific, Illirch, France) (22). The arm was positioned and immobilized in an inflatable splint. The echotracking probe was placed over the BA, 1 to 2 cm above the elbow, and positioned carefully with a stereotactic arm parallel to the main BA axis. Image quality was maintained throughout the study by gentle adjustments of the XYZ axes. The skin was gel-coated to avoid any direct contact with the probe. After 15 min of rest, the measurements were made at a water temperature of 35°C (neutrality). The water temperature then was increased during 5-min periods from 35 to 38, to 41, and to 44°C; each level was maintained for 5 min. BA hemodynamic measurements were repeated five times during each step and averaged. FMD was expressed as percentage change of BA diameter from baseline to 44°C. Arterial calcification presence in the common carotid arteries, the abdominal aorta, the iliofemoral axis, and the legs was evaluated ultrasonographically as described previously (23). Arteries were scanned longitudinally and transversely to detect the presence of calcified plaques (those that produce bright white echoes with shadowing). This assessment was completed with lateral fine-detail radiographs of the abdomen, posteroanterior radiographs of the pelvis, and soft-tissue images of the femorotibial axis. AC in specific regions were assigned as a binary value, absent (0) or present (1). The final overall score, obtained by adding the AC scores from all studied regions, ranged from 0 (no visible calcium deposits) to 4 (generalized calcifications present in all arterial segments examined). All blood chemistries were determined on samples that were drawn before hemodynamic study and included serum albumin, serum high-sensitivity C-reactive protein, blood lipids, serum phosphates, and Ca2+. Serum parathormone (iPTH 1-84) was measured by RIA. Winter serum 25(OH)D was determined with the LIAISON 25 OH Vitamin D assay (D2 and D3; DiaSorin, Stillwater, MN) on the LIAISON analyzer according to the manufacturer’s instructions (24). Serum 1,25(OH)2D3 was determined by RIA (1,25-Dihydroxyvitamin D 125I RIA KIT; DiaSorin) for 40 patients. Data are expressed as means ± SD or (medians), depending on the distribution. Serum 25(OH)D and PTH were log10 transformed. Univariate Pearson correlation coefficients were used to assess the relationship among biochemical, clinical, and arterial parameters. P < 0.05 after Bonferroni correction for the number of tested relationships was considered significant. Multiple regression analysis was performed using the subset of univariate analysis–selected independent variables. Serum 25(OH)D and 1,25(OH)2D3 levels between the various AC scores were compared using Kruskal-Wallis one-way ANOVA and multiple comparison z scores with Bonferroni correction. All tests were performed using NCSS 2000 (Gerry Hintze, Kaysville, UT). The baseline clinical and biochemical characteristics are reported in Table 1. Serum albumin and total cholesterol were within their normal ranges, and serum C-reactive protein was increased moderately. Mineral disorders were characterized by normal serum total and ionized calcium levels, elevated serum PO4 and intact PTH, and low serum 25(OH)D and 1,25(OH)2D3. Serum 25(OH)D3 and 1,25(OH)2D3 were weakly correlated (r = 0.365, P < 0.05). Serum 25(OH)D3 was below the recommended sufficiency values in >90% of our patients with ESRD (Figure 1). Serum 25(OH)D3 was negatively correlated with age (r = −0.346, P < 0.05) but not with BP (r = −0.239; NS). 1,25(OH)2D3 was not correlated with age (r = −0.234; NS) but was inversely correlated with SBP (r = −0.360; P < 0.05). No correlation was observed between vitamin D parameters and PTH, serum phosphate, or calcium. 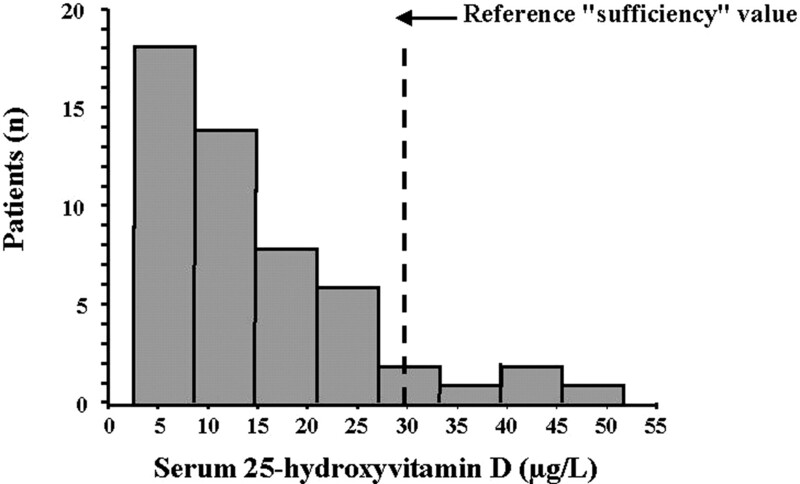 Serum 25-hydroxyvitamin D3 distribution in studied the ESRD population. The dashed vertical line represents the sufficiency concentration. The principal arterial parameters are given in Table 1. 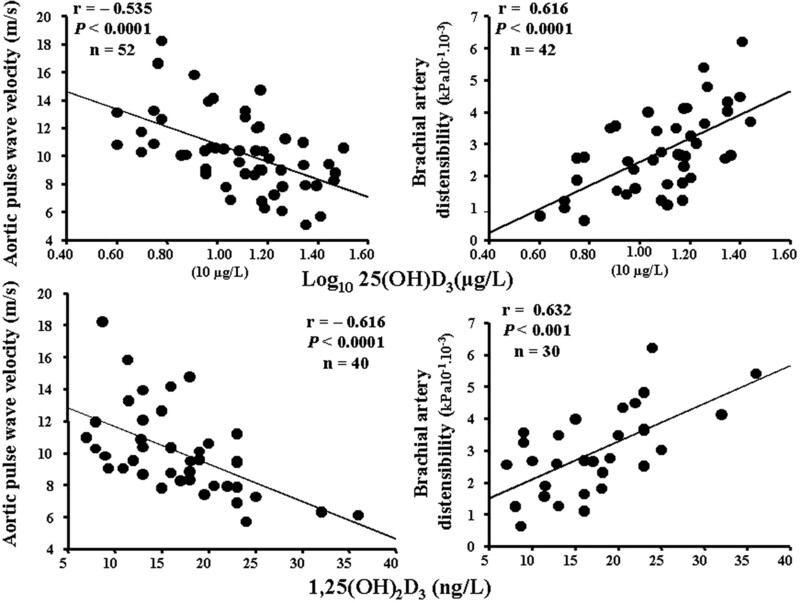 Univariate associations between arterial and blood chemistry parameters are shown in Table 2. As classically observed, aortic stiffness and BA distensibility were correlated with age and SBP. FMD was positively correlated with 25(OH)D3 and 1,25(OH)2D3. Independent of age or SBP, we observed negative correlations between serum 25(OH)D or 1,25(OH)2D3 and aortic PWV and positive correlations between 25(OH)D3 or 1,25(OH)2D3 and BA distensibilities and FMD (Table 3, Figures 2 and 3). Serum 25(OH)D3 was lower in patients with higher arterial calcification scores (r = −0.419, P < 0.01; Figure 4), but calcification score was strongly age dependent (r = 0.646, P < 0.0001), and, after adjustment for age, arterial calcification score no longer was correlated with serum 25(OH)D3 (P = 0.151). No association was found between arterial calcification scores and serum 1,25(OH)2D3 (Figure 4). Correlations in patients with ESRD between 25-hydroxyvitamin D [25(OH)D3] and 1,25-dihydroxyvitamin D3 [1,25(OH)2D3] serum concentrations and aortic pulse wave velocity and brachial artery (BA) distensibility. Correlations between BA flow-mediated dilation (FMD) and serum 25(OH)D3 concentration (left) and serum 1,25(OH)2D3 concentrations (right). Box plots indicating 25(OH)D3 and 1,25(OH)2D3 levels according to arterial calcification scores. The horizontal line within the boxes are the medians; the lower and upper limits of the boxes are the 25th and 75th percentiles, and the T bars are the 95% confidence intervals. The principal results of this study indicate that, in addition to aging and BP pressure as major factors that influence arterial functional and mechanical properties, arterial dysfunction in patients with ESRD was significantly associated with vitamin D deficiency and low 1,25(OH)2D3 levels. Arterial stiffening and decreased FMD are well documented in patients with ESRD, and some of these abnormalities also were observed previously in patients with mild to moderate chronic kidney disease (3,6,7). Although some of these changes are the consequence of mechanical load, reflecting flow or pressure changes, nonhemodynamic factors might be implicated. Aging and hypertension are the principal factors associated with arterial stiffening and also are associated with arterial abnormalities in patients with ESRD. Many vasoactive and metabolic factors and growth promoters can modulate the properties of arterial walls, and nonconventional risk factors, including inflammation, malnutrition, and mineral-metabolism disorders, have been associated with arterial dysfunctions and cardiovascular death (13,25–27). However, the participation of these factors in the arterial changes that are seen in ESRD has not yet been demonstrated clearly (and constantly). The frequently but not constantly incriminated factors that are associated with arterial stiffening or remodeling in ESRD are alterations of mineral metabolism, such as hyperphosphatemia, hypercalcemia, high Ca-PO4 product, hyperparathyroidism, and arterial calcifications (11–14,23,28,29). No other factor (e.g., serum calcium, serum phosphates, Ca-PO4 product) was associated with arterial stiffening or arterial conduit function abnormalities herein. The existence of a role of increased PTH levels in the arterial abnormalities in patients with ESRD remains unclear, with some authors indicating that PTH as associated with stiffening (28,29) but not observed by others (23,30) and not found in the present population despite the wide scatter of PTH levels. The only age- and SBP-independent factors that were associated with arterial stiffening and abnormal FMD were low serum levels of 25(OH)D3 and 1,25(OH)2D3. Vitamin D intoxication or pharmacologic doses of active vitamin D are associated with increased microvascular resistance and AC (31). Pharmacologic doses usually are applied in experimental studies, and vitamin D is associated with other substances, such as nicotine or antivitamin K, which potentiate its toxic effects (31). However, AC could be linked to hypercalcemia and not only to the action of vitamin D. In the general population, the circulating 1,25(OH)2D3 levels were not or were inversely correlated with coronary calcifications (32). In our study, serum 25(OH)D3 was lower in patients with high calcification scores, but 1,25(OH)2D3 levels were comparable for all calcification scores. Nevertheless, because arterial disease usually progresses with age whereas vitamin D serum levels decline, the absence of an association between AC and vitamin D does not exclude the latter’s role in the pathogenesis of calcifications. Because 1-α-hydroxylase converts 25(OH)D3 into its active hormonal form, 1,25(OH)2D3, and because we observed a weak but significant correlation between the two forms of vitamin D, the question is whether the observed relationships indicate an association with 25(OH)D3 or 1,25(OH)2D3. The correlations between arterial parameters were observed with both metabolites, suggesting that not only 1,25(OH)2D3 but also its precursor are linked to arterial dysfunction. 25(OH)D3 is able to activate the vitamin D receptor directly (33), albeit with low affinity, but partially compensated by >1000 times higher serum 25(OH)D3 concentrations (33). Active vitamin D and its receptor ligands have several noncalcemic actions, including antiproliferative, prodifferentiating, and immunomodulatory activities (34), and vitamin D deficiency is associated with a higher risk for development of several diseases, including cancers, type 1 diabetes, cardiovascular disease, and osteoporosis (15,16,18). Results of experimental studies showed that active vitamin D regulates cardiomyocyte proliferation and hypertrophy (35), improves cardiac function, and induces left ventricular hypertrophy regression in patients with ESRD (36,37). 1,25(OH)2D3 is a negative regulator of the renin-angiotensin system (38) and might be involved in the pathogenesis of hypertension and hypertension-associated cardiac and arterial disorders (17). In this study, the association between arterial stiffening and 25(OH)D3 or 1,25(OH)2D3 serum concentrations was independent of age and arterial BP. According to cross-sectional human studies, vitamin D deficiency was associated with increased circulating concentrations of matrix metalloproteinase-9, which controls vascular wall remodeling and is increased in unstable angina, and vitamin D supplementation was associated with decreased serum matrix metalloproteinase-9 concentrations (39). Hypovitaminosis D is associated with decreased levels of HDL cholesterol–associated apolipoprotein A-I (40,41), and vitamin D supplementation had a beneficial effect on the elastic properties of the arterial wall in a randomized, placebo-controlled interventional study in postmenopausal women (42). Endothelial function is altered in patients with ESRD, as shown by decreased vasodilator responses of the macro- and microcirculations (8–10). FMD, as assessed by BA diameter changes, enables examination of the arterial response to local flow, independent of the maneuver that is used to induce flow changes (20). Factors that are known to contribute to endothelial dysfunction in ESRD include reduced bioactivity of the nitric oxide pathway with decreased endothelial nitric oxide synthase activity or inhibition via accumulation of endogenous inhibitors (25). Endothelial cells also respond to flow changes by releasing other vasodilating factors, such as prostacyclin or endothelium-dependent hyperpolarizing factor (acting on Ca2+-activated K+ channels). Mullen et al. (20) showed that the FMD response to hand warming is not attenuated by N-monomethyl-l-arginine, cyclooxygenase inhibition, or local autonomic nervous blockade. In patients who were on dialysis, vein relaxation was inhibited by tetraethylammonium chloride (inhibitor of Ca2+-activated K+ channels) but not N-monomethyl-l-arginine or asymmetrical dimethylarginine (43). In our study, serum 25(OH)D3 and 1,25(OH)2D3 levels were age- and SBP-independently and positively associated with FMD (Tables 2 and 3). Vitamin D receptors and 1α-hydroxylase activity are present in endothelial and vascular smooth muscle cells, and 1,25(OH)2D3 stimulates vascular endothelial growth factor (44). It was shown experimentally that exposure to cholecalciferol improved the relaxation response of spontaneously hypertensive rat arteries to acetylcholine (45) and that this effect was mediated by recovery of impaired Ca2+-activated K+ channels (46). Finally, it was reported that vitamin D3 stimulated prostacyclin production by vascular smooth muscle cells (47). Increased arterial stiffness and decreased reactive hyperemia are independent predictors of all-cause and cardiovascular mortality in patients with ESRD (2,10). The results of a recent study showed that patients who were on long-term hemodialysis and receiving active injectable vitamin D benefited from significant survival advantages (48). Whether these associations could be related to vitamin D–induced improvement of arterial functions remains to be demonstrated in prospective, controlled studies. Our study has two principal limitations. First, the studied patients were clinically stable with normal lipid status, the absence of pronounced inflammation and malnutrition, and relatively satisfactorily controlled calcium and phosphate status. These conditions may obscure the contributions of these factors in less well-controlled populations. Nevertheless, the arterial disorders were those that classically are observed in patients with ESRD, and the association with serum 25(OH)D3 and 1,25(OH)2D3 was strong and independent of age and SBP. Another limitation is that we studied nonsupplemented patients with vitamin D deficiency, which is not a situation that is associated with high, pharmacologic doses of vitamin D or high or eventually toxic serum concentrations, all conditions that could have different impacts on the arterial system. Finally, another limitation is the observational nature of the study. Although such observation is hypothesis generating, an association does not indicate a cause-and-effect relationship. The results of this study indicate that the majority of patients with ESRD are vitamin D deficient, and this deficiency is independently associated with abnormal conduit and capacitive functions of large arteries. Whether vitamin D supplementation could improve arterial function and whether this improvement could contribute to better outcomes remain to be investigated in controlled, prospective studies. This work was funded by unrestricted grants from Ortho-Biotech Biopharmaceuticals EMEA, CKD Steering Committee Project 124026, and Groupe d'Étude de la Physiopathologie de l’Insuffisance Rénale. We express special thanks to Dr. Dieter Frei for support. See the related article, “Calciotropic Hormones and Arterial Physiology: D-lightful Insights,” on pages 369–373.